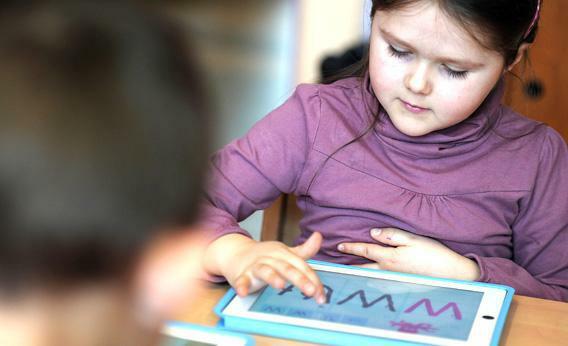 IPads in the classroom: The right way to use them, demonstrated by a Swiss school. It’s not about the games or educational apps. Can American public schools learn to use iPads and other touch-screen technology in a meaningful way? This notion of using the iPad to make learning visible is not without hiccups, however—particularly when it comes to filming and editing. Despite all the talk about kids being “digital natives” who can navigate iPads before they can walk, teaching children to create videos isn’t easy. When I watched the first-graders complete their assessment on systems, one girl’s videos wouldn’t save at first—a technical problem that could have dissolved into a meltdown if a teacher had not been sitting right next to her to help. “It gave me gray hairs,” said a first-grade teacher about those first few weeks teaching iMovie to 6-year-olds. But she quickly added that the extra time was worth it.